This Template/System is fully customised for you and installed for you too if required, ensuring your system meets your business needs. Large Screen (PC), Tablet and Mobile Web Sites Included. Auto select version on accessing home page. Choose Pay by PayPal, COD or Credit Card on Delivery via Portable Card Machine. Delivery only allowed to selected postcodes and each postcode can be free delivery or a selected amount. Customisable in WebPlus and via Control Panel. Menu Page can be viewed with ALL items or by category: Meal Deals, Appetisers, Main Courses, Side Orders, Soups, Desserts, Cheese and Biscuits, Wines, Beers and Spirits, Soft Drinks and Teas Coffees. Menu Items are disabled from ordering when restaurant is closed. Allows on-line Table Booking and management. Allows for unlimited options on each Menu Item, e.g. Standard, Large, Extra Large. Rare, Medium, Well Done. With Chicken, With Pork, With Beef. etc. and each option can either add 0 to the cost or a specific amount. Attach one of 3 VAT rates to each menu item and VAT auto-calculated and displayed to customer at checkout and on receipt and emails. Display a different Eat-In and Takeaway/Delivery price for each item. Display menu item image with listing that can be enlarged on click. Easily disable the availability of an item with two clicks. Unlimited Control Panel Users, with 3 access levels. Easily set up Coupons/Vouchers for discount off orders, with minimum order values and date ranges that can be applied and verified online. Easily Manage Opening Hours that restrict online takeaway/delivery orders to when restaurant is open only. Send Emails to customers directly from the control panel, and view sent emails in control panel. Management routines to optimise and backup database quickly and automatically. Kitchen area shows pop-up when order added online. Kitchen user can view the order by item and change each items status from New to In Progress, Ready etc. Kitchen User can also send email to customer to advise delivery/collection time and update the overall order status. They can also print the receipt. When the order is marked as delivered or collected it is removed from the current orders list. All other orders with any status are removed from orders list after 12 hours. Kitchen staff are automatically re-logged in if session expires so that no order updates are missed. Includes a comprehensive PayPal IPN Listener. This takes care of instances where the customer does not return to your site after making payment, as It will get PayPal to send any transaction data to the IPN Listener so the order record still gets updated. It also means that if the initial status from PayPal is Pending (while they make fraud checks etc) and is later changed to complete, the order record will be updated and can then be processed. It also means that if you later refund the transaction in PayPal the order record is again automatically updated. Choose whether or not to have pop-ups on home page when store is open and closed or just one or the other or none. Featured Item on menu page (PC Version only). Every time the menu is opened or an item added to cart or a new Menu Category is selected a random item from the menu appears in the Featured Panel with a ‘Why not try….’ Message to the customer. Items from this panel can be added to the cart directly from the panel. WebPlus - You will require Serif WebPlus X8 to use the system template. Not got WebPlus? - No problem, the system can be supplied as a fully customised ‘files only’ web site with your content and images etc. which you simply upload to your web space. Contact for details. Web Server - You will require a Linux/Apache PHP enabled web server, with the MySQLi, Imagick extensions. Some modifications to the php.ini or addition of .user.ini may be required to extend the facilities available. Got a Windows Server? If your Windows Server has PHP with MySQLi and Imagick, the system will work with it providing the server configuration is correct, if not your host may need to change some configuration for you. Easy to change the colour scheme using the standard WebPlus schemes and settings page in Control Panel. Easy to set parameters for the system in a comprehensive Control Panel. Kitchen Area -The Control Panel includes a dedicated ‘Kitchen Area’, new orders placed online by customers appear in the ‘Kitchen’ as placed, where the status can be updated, emails sent to customers and receipts printed to a till receipt printer. Full Management -Control Panel allows management of orders and table bookings, together with system settings, till receipt messages, opening hours, postcodes and much more. User Guide - In your pack you will also receive a comprehensive user guide. EXTENSIVE SYSTEM FEATURES - The features of the template are extensive and comprehensive to manage your menu, orders and table bookings. 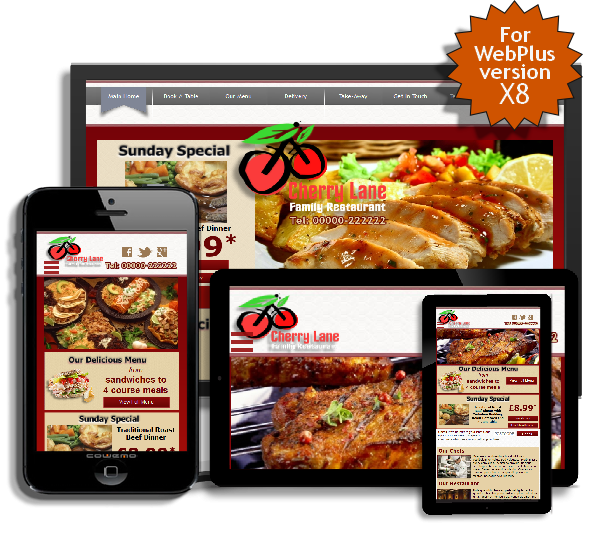 No other Restaurant Template for WebPlus has the facilities of this incredible template system.